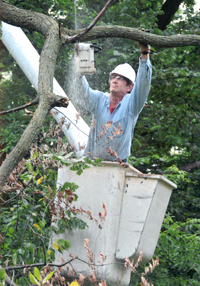 When you seek professional tree care around your home, Grant’s Tree Company is the company to call. We enjoy working with homeowners, whether you have one tree that needs care or a large estate filled with numerous types of trees, ornamental trees, and bushes. When you decide to work with Grant’s Tree Service, we will set up a convenient time to arrive at your home. Anticipate our on-time arrival, of which most customers express delight and appreciation. We will call you on those rare occasions that we run behind from a prior job. Also, as a courtesy, we will call the day prior, sharing an approximate time of arrival. Upon arriving at your home, we will meet with you, learn your specific needs, walk around your grounds, and evaluate your trees and bushes. We then will share our thoughts and an estimate, and create a plan for your property. Upon initial inspection, we look at your trees with an eye for safety, determining what trees and/or bushes must be trimmed for safety’s sake. For example, one of our customers has six grandchildren and wants a safe environment for them to play in the backyard. In the process, we determine if a tree is a candidate to be saved, or if it is unfortunately sick or dead, and should be removed. We also evaluate with a creative eye to bring forth aesthetic appeal. We make sure that trees and bushes look very nice and well-kept, rather than raw or newly trimmed. We actually enjoy trimming areas that need attention and pride ourselves in beautifying environments and trimming in ways that give you an attractive outdoor environment. Along with trimming neighborhood homes, we maintain a variety of estates to ensure their aesthetic beauty. Customers appreciate our comprehensive cleanup activities at the end of a job. One customer was extremely impressed at how thoroughly we cleaned the willow trees that we trimmed, which can be quite messy, leaving no trace that we had been there. If you worry about power lines running through your trees, knowing that many tree companies will not trim trees among the wires, meet Don Grant, a journeyman tree trimmer for power lines. Don and his highly-experienced and reliable team will gladly trim around your utility wires. Should you wonder about trees and limbs that may feel a bit too close to your house, garage or other building(s), we are happy to come by and assess your trees to proactively avoid current or future issues. At Grant’s Tree Company, we are professionals, and safety is first. We take every precaution to protect you, your home, garage, or fence. We look forward to working with you. We invite you to call Grant’s Tree Company at (248) 681-0498. Should you experience emergency storm work, feel free to call us or text us at (248) 563-1010. © Grant's Tree Co. All Rights Reserved.